(Nanowerk News) Nothing could be simpler: a drop of blood is placed on a special carrier substance; after a wait of a few minutes, the slide is placed on a device that emits polarised light thanks to an inexpensive polarisation filter. It is covered with a lid containing a second polarisation filter, which blocks the light from all materials except crystalline or materials with directional properties. If light is visible through the cross-polariser filter, a positive diagnosis is made. Through this an immediate 'yes or no' screening is possible. It is also possible to measure the light intensity, and thus the amount of the pathogen, through a simple light meter plugged into a smartphone and controlled via an app. What sounds almost like science fiction has now become reality. The research group led by Raffaele Mezzenga, Professor of Food and Soft Materials, has recently published a scientific paper in which it introduces a new rapid test that can detect not only malaria parasites but also viruses such as HIV or Ebola, diverse bacteria or biomarkers, like glucose or cholesterol. The detection methods are not only extremely fast; they are also considerably less expensive when compared with other detection methods. The polarisation device costs just CHF 20, says Jijo Vallooran, first author of the paper, which has just been published in the journal Advanced Functional Materials ("Lipidic Cubic Phases as a Versatile Platform for the Rapid Detection of Biomarkers, Viruses, Bacteria and Parasite"). Although the concept behind this new technology is very general and appears so easy to operate, the scientific basis underlying the invention of the ETH researchers is extremely complex. The scientists use the phenomenon of birefringence of polarised light from the lipid based lyotropic liquid crystals, which consist of self-assembled structures of fat molecules in water. 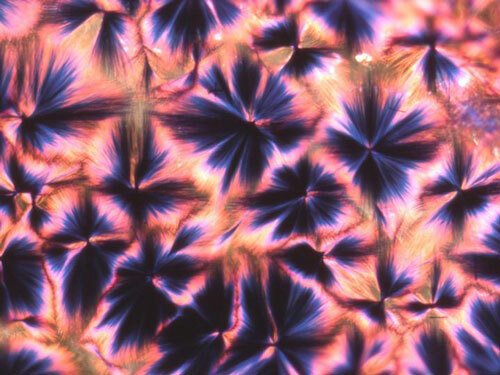 The group of Prof. Mezzenga has been working with these liquid crystals for long time and exploits them also for other applications, such as drug delivery and protein crystallisation. Lyotropic liquid crystals organise themselves into special networks with unique symmetry, which means that their basic motif repeats itself periodically. In the case of liquid crystal cubic phases, the channels are made of lipid bilayer membranes in water and have a diameter of just a few nanometres, so only few free water molecules are available in the liquid crystal, whereas the majority is bound to the channel walls. These liquid crystal cubic phases are isotropic, or so to say, do not have any birefringent properties, which means that if a slide with a layer of lyotropic liquid crystal films is placed under a light source that allows polarised light to pass through, it appears black when observed through another polarizer tilted at 90°. To achieve birefringence and thus receive a signal, the researchers reached again into their bag of tricks: they added certain enzymes to the liquid crystal to allow a chemical reaction to take place in the nanotubes. Since only a small amount of water is freely available in the nanotubes, the products of the reactions precipitated together to form crystals, which are themselves birefringent. A closer look at the sample through a second polarisation filter placed above it and perpendicular to the first shows a light pattern in instances where the enzyme has reacted with the substance tested. "This birefringence pattern is the only signal that we need to use for diagnostics and analysis," says Mezzenga. At the beginning of their research, the scientists tested their system with chemical compounds that can be enzymatically converted. They then refined their method and adapted it for medically relevant substances, such as glucose and cholesterol. In further steps, they broadened the scope to tests on bacteria and viruses, starting with the HIV virus. Eventually, Mezzenga, Vallooran and colleagues, were able to show that their method could also be adapted to diagnose malaria caused by Plasmodium parasites. "Plasmodium parasite invades erythrocytes and digests haemoglobin. The heme component, which is toxic to the parasites, is crystallised and thus has inherently birefringent surfaces. So it's not necessary to mark it with antibodies and no enzymatic reaction is required" explains Mezzenga. Normally, viruses and bacteria must be made visible and chemically active with specific antibodies with enzymes coupled to them before they can be detected by birefringence. "Our test system can be extended to a large number of different viruses or bacteria. It is totally flexible," stresses Vallooran. As it is so easy to use and because only one set of antibody-enzyme conjugates is necessary to detect viruses, the ETH researchers believe it can be used particularly in areas where expensive laboratory equipment is otherwise unaffordable. "Other than a refrigerator to store the antibodies and enzymes, the user needs only the box to detect the polarised light and the lipid carrier substance. This is very inexpensive," says Vallooran. Pathogens such as HIV or even Ebola can be detected very rapidly, and a reliable result received within less than an hour. "Our technology is very suitable for use in the field and the early detection of diseases." The researchers have also filed a patent application for the new technology. "We want to produce something genuinely useful," says Vallooran. The potential for this method of detection is extremely high, particularly when new diseases that spread rapidly flare up, such as Malaria or Ebola. But more funding is still needed to bring the development to the market and the ETH researchers are actively working on it.